What is the best gift you have ever received? Although a bicycle or a doll is a wonderful gift, the greatest gift cannot be bought with money. It is a gift everyone can receive. 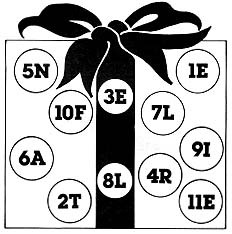 Place the scattered letters in the blanks with the corresponding numbers to find out what the greatest gift is. which gift is the greatest of all the gifts of God (D&C 14:7).